Producer Brian Tate talks to the inventor, the production manager, the test-mechanics, the fitters — or rather, he asks questions and listens. He is looking for the bare outline of the story, the skeleton of his programme; and after that, for touches of character, colourful anecdotes, voices with personality, distinctive turns of phrase — anything to garnish the story with liveliness and ‘bite’. There’s a foreman who talks well; another chap with one good story of the early experimental days; an interesting machine noise. 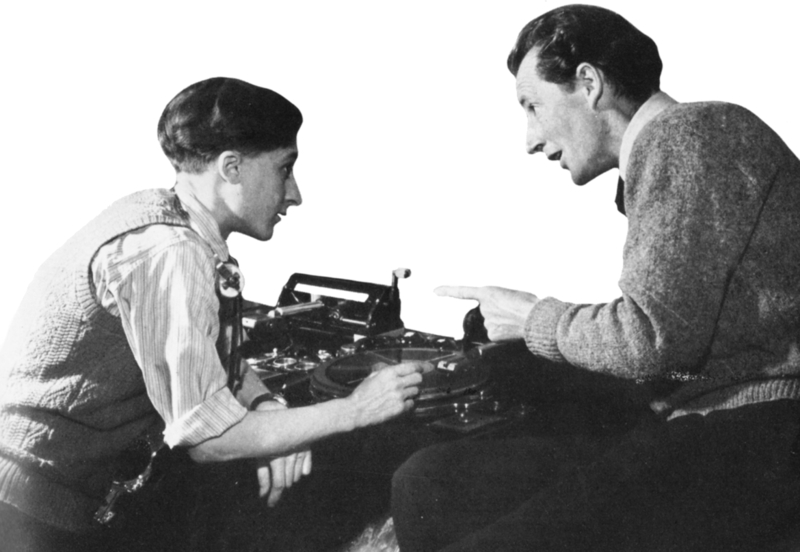 Promising bits and pieces in the jig-saw of script-making. Tate goes on asking questions until he reckons he has absorbed the essential material and mastered the outline of the story, and then he goes back to Bristol. 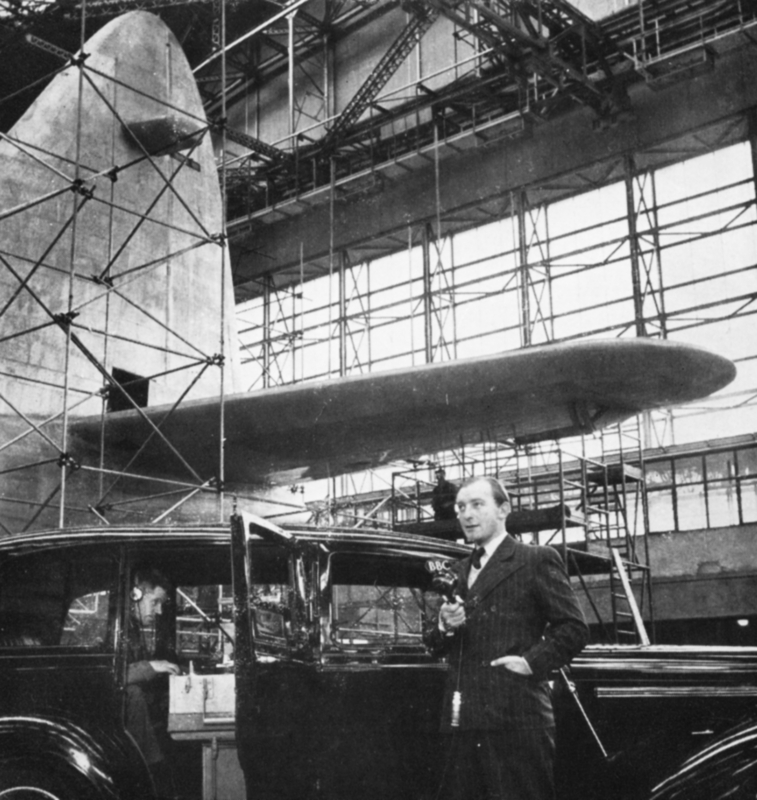 BY THE TAIL of the giant Brabazon aircraft, Peter Maggs records progress in a great West-country enterprise. In the car Jimmy Cauldfield vets the quality of each disc. He can now start writing his script. It must not be so technical that the broad general public cannot follow it clearly, nor so popularized that specialists in the subject dismiss it as trivial and misleading. A compromise here — simplifying without distortion. When the first draft of the script is complete it will go to the planners of other services, and since M32 is a spectacular subject of the widest appeal we may assume that in due course Tate receives several teleprinters expressing interest in his project. M32 scheduled in basic Home Service on such-and-such a date. Overseas Planners want M32 recorded off transmission for overseas repeat. M32 accepted for transcription. Transcription, incidentally, means that the programme will be sent to smaller broadcasting organizations in the English-speaking world in the form of processed recordings — similar to commercial gramophone records — which can be used at suitable local times. 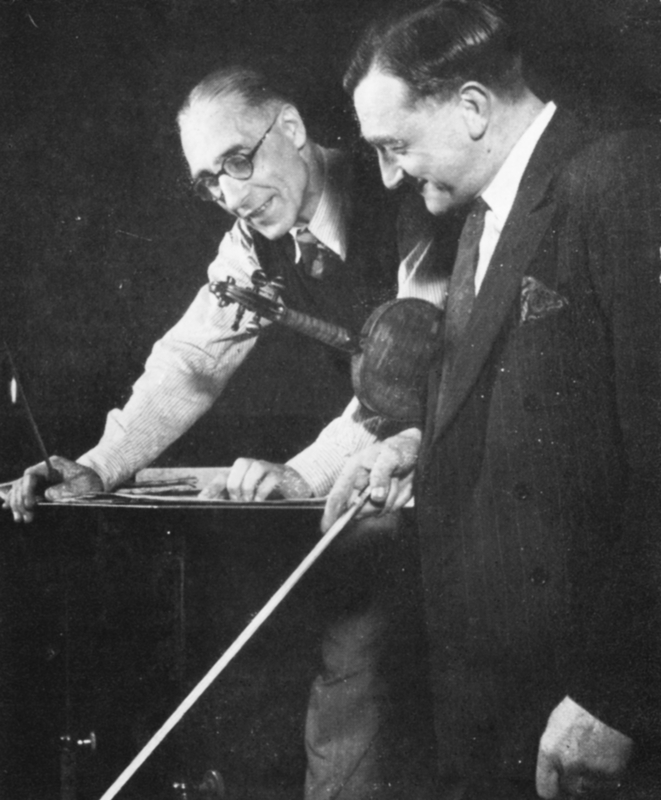 ‘LET’S CHECK THIS, NORMAN’ – The leader of the West Country Studio Orchestra, Norman Brooks, discusses a new score with the conductor, Leonard Dennis. With the script approaching final shape the producer is ready to brief the musician who is to compose the music. ‘On page 3 I want a slow build-up, heavy, rather ominous — about twenty-five seconds of it — and then you check it and run behind the following speech — should take another fifteen seconds, that — and then you start to swell up through him to a triumphant peak. Full-throttle, brassy, elated — and cut out fairly sharply, I think. Do you see what I’m after?’ The producer describes the effects he wants to achieve. The composer considers how to convert these ideas into music. His first sketches are written for piano; when they have been demonstrated and argued over and modified, the composer prepares an orchestral score. It will soon be time now to send off the ‘billing’ to Radio Times for inclusion in the published programmes. There is casting to be done, so that the actors’ names are included in the billing. There is publicity material to prepare. Copyright details have to be cleared, studios booked, recording facilities laid on, operational matters settled with various engineering sections. As the days pass, one department after another begins to focus on the forthcoming production of M32. ‘BRING IT IN BEFORE THE WHISTLE’ – Reggie Miles plays over a batch of effects discs, and Drama Producer Owen Reed chooses the ones that build up the impression he wants.